This Weekend Interview gives a brief insight into Rex’s history, his current passions for change and where he sees his efforts in the near future. Liberals who suspect that wealthy businessmen and political masterminds are colluding to hijack democracy might have fainted had they walked into the St. Regis hotel’s lobby restaurant in New York the other day. There was Rex Sinquefield, a deep-pocketed St. Louis, Mo., native and big-time political donor, sitting across from the Republican Rasputin himself, Karl Rove. The not-so-vast right-wing conspiracy in plain public view. Mr. Sinquefield, an index-fund pioneer, has not drawn the fear and loathing that liberals devote to the billionaire Koch brothers and casino magnate Sheldon Adelson. Oh, Bloomberg News referred to him as “a new American oligarch,” and the New York Times recently painted an ominous portrait of him as “perhaps the most influential private citizen in the state.” But no one has picketed his home, Mr. Sinquefield says, or harassed his guests. At least not yet. He is nonetheless one of the nation’s biggest conservative donors in a political year when they are much in the spotlight. So it seems like a good moment to meet one of these princes of alleged darkness in person and see the conspiracy from the inside. It turns out the inside looks a lot like it does from the outside. At age 67, Rex Sinquefield is a successful businessman and conservative who is passionate about his country and wants to turn its policies in a more prosperous direction. He’ll even spend lots of his own money to do it. His own voice is heard in particular in Missouri. The state ended limits on campaign contributions in 2008, and public sources show that Mr. Sinquefield has since spent more than $21 million on various causes and candidates (nearly $7 million in the past two years). He says that’s merely the start of what he’ll spend to promote his two main interests: rolling back taxes and rescuing education from teachers unions. In the current political season, Mr. Sinquefield has given $400,000 to Republican secretary of state candidate Shane Schoeller, a 41-year-old free-marketeer who supports education reform. Mr. Sinquefield has backed at least a dozen other candidates in the 2012 campaign—mostly, but not exclusively, Republicans. Democrats can get a check if they’re tax cutters who favor education reform or free markets. Chris Koster, a Republican-turned-Democrat running for re-election as Missouri attorney general, received a $250,000 check this year. St. Louis inspires Mr. Sinquefield’s particular devotion, but his childhood there was hardly happy. His father died when he was 5 years old, leaving the family destitute. He and his brother were reared in a local Catholic orphanage until they were teenagers, when they returned to live with their mother. Mr. Sinquefield went to St. Louis University and took some economics courses, but says “it was all a waste. Keynesian crap. Mr. Sinquefield seems less interested in politics than policy and less moved by campaigns than the ideas behind them. He has long been frustrated by the Missouri state legislature, which is controlled by Republicans but is largely opposed to real reform. The best he can say is that they “do prevent a lot of bad stuff from passing. So in recent years he has tried to go over the head of legislators through ballot initiatives. In 2010, he spent $11.3 million to underwrite an initiative to ban new local income taxes in Missouri and to require voters in St. Louis and Kansas City to reaffirm support for existing tax levels. This year he spent more than $2 million collecting signatures to eliminate the state’s corporate and personal income taxes and replace them with a sales tax capped at 7%. Mr. Sinquefield decided to postpone the initiative until next year because it wasn’t polling well. “By 1820,” he says, “there were a hundred steamboats a day on the edge of St. Louis coming down the rivers from the East. If you wanted something from Europe, it had to go through St. Louis. He has also launched the Chess Club and Scholastic Center of St. Louis, which attracts novices and experts from around the world to its tournaments. Chess legend (and Wall Street Journal contributor) Garry Kasparov has taught classes there. Mr. Sinquefield has also supported chess programs in St. Louis public schools—one part of his major effort to salvage the deeply troubled system. In 2007, the city’s school district lost accreditation from the Missouri State Board of Education and was placed under state supervision. Fewer than 20% of students were testing at grade level in reading or math. Last week, provisional accreditation was granted, but that is hardly cause for celebration—in the spring, fewer than a third of its students passed the math and reading exams. In 2014, Mr. Sinquefield is planning his most ambitious ballot initiative to date: abolishing teacher tenure in Missouri. He says the initiative polls very well, particularly when tied to merit pay. But he knows that “teachers unions would come in from across the country to oppose it. This will be a brutal battle. 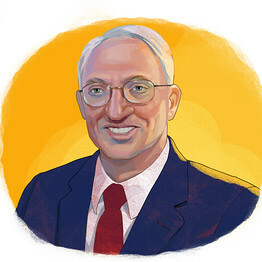 Citing Milton Friedman, Mr. Sinquefield says: “In every business, in every industry, consumers have almost complete choice, except for the one that’s most important, which is education.” He has funded 2,000 scholarships to private schools for public-school students, through a voucher program run by the Archdiocese of St. Louis. Ms. Riley is the author of “The Faculty Lounges: And Other Reasons Why You Won’t Get the College Education You Paid For” (Ivan R. Dee, 2011).